It’s commonly quoted as fact that in nature, no food or vegetable is naturally blue. This information was again disputed recently by the re-introduction of blue Smarties1, this time using 100% natural seaweed extract to create the blue colour. Additional support for the “blue-in-nature” brigade comes in the form of blue trees spotted on Google Earth. Firstly, in Australia’s Mount Annan Botanic Garden there’s a strikingly-blue tree. The Garden’s website explains that the tree has been dead for many years, but is home to various types of termites and slaters. So, it’s the termites that make the tree blue? Well, no. Further investigation reveals that the tree was in actual fact painted blue. For no particular reason. Perhaps we’ll have better luck with this blurry shot of a blue tree in Northern California. Unfortunately, this isn’t natural either. It’s the work of artist Claude Cormier, who decorated a perfectly normal tree with 70,000 blue Christmas baubles. Again, for no particular reason it would seem. So perhaps natural blue is restricted to seaweed after all! See a ground level pictures of the Australian tree and the American one on Flickr. Thanks to Felippo, Logan and James. How beautiful the tree is! Australia has several species of bluegum, a variety of eucalyptus with blue leaves. There are lots of blue flowers and blue fruit, and trees with blue bark are not that uncommon, so I assume you meant blue leaves. But then the two trees you present do not have leaves. 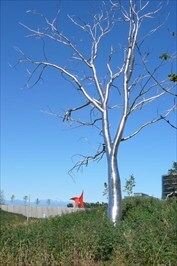 Here is a silver tree named Split by Roxy Paine, Olympic Sculpture Park, Seattle, WA. @Discostu: I think that, despite the name, blueberriers are more purple than blue. Nice shots of some trees with purple flowers on them here…ahhh, Beverly Hills memories. I ate some blue mushrooms once. Man what a trip! the australian one is painted blue as part of an educational trail for young children. there are lots of other colorful things and even two foot high wooden snails.